Nikarakara Bersih 3.0 Duduk Bantah (hetsika sit-in) ny hetsika ho amin’ny fanitsiana hisian'ny fifidianana (Madio) ny 28 aprily any Dataran Merdeka ao Malezia. Nahitana fitakiana telo ny hetsika. 1. The Election Commission must resign, as it has failed in its responsibility and has lost the confidence of the public. 2. The electoral process must be cleaned before the 13th General Elections. 3. Asaina ny mpanara -maso iraisam-pirenena mandritra Invite international observers to observe the 13th General Elections. Through BERSIH 3.0, we will continue our struggle for clean and fair elections, assembling and expressing our views peacefully as are our rights as enshrined in the Federal Constitution. 1. Tokony hametra-pialana ny vaomiera misahana ny Fifidianana, satria tsy nahavita ny andraikitra nomena nosahaniny no tsy atokisan'ny vahoaka intsony. 3. Manasa ny mpanara-maso iraisam-pirenena hanara-maso ny fifidianana ankapobe faha-13Amin'ny alalan'ny BERSIH 3.0, no hanohizantsika ny tolona ho amin’ny fifidianana madio sy marina, ka hanambarana sy hanehoana ny fomba fijerintsika am-pilaminana izay zontsika araka ny voalaza ao amin'ny lalampanorenana federaly. Setriny avy amin'ny vondrona ihany koa ny hetsika manoloana ny torolalana avy amin'ny Komitin'ny parlemantera nofantenina tamin'ny parlemantera izay manala ny Bersih ho tsy mety. BERSIH 2.0 is of the belief that many of the recommendations made by the Parliamentary Select Committee can be immediately implemented. We do not see the need to provide for a lengthy implementation period. We reiterate that BERSIH 2.0 has demanded that reforms should be implemented BEFORE the 13th General Elections are held. BERSIH 2.0 is of the view that it is highly likely that the electoral fraud and other irregularities that are currently being perpetrated in Malaysia, and which have been and continue to be the concern of decent, fair-minded and peace-loving Malaysians, will continue unabated. A golden opportunity to right the wrongs and do something good for the benefit of Malaysians now and in the future has sadly been missed. Bersih 2.0 no fanantenana fa betsaka amin’ireo torolalana nataon’ny komitin'ny parlemantera nofantenina no afaka ampiharina avy hatrany. Tsy hitanay izay antony hakana fotoana maharitra amin'ny fanatanterahana ny asa. Averinay indray fa Bersih 2.0 no nangataka ny fanovana ho azo ampiharina avy hatrany ALOHAN'NY fifidianana ankapobeny faha-13. Bersih 2.0 no manana fijery fa mety hitranga ny fifidianana misy hosoka sy ny tsy fahatomombanana hafa izay atao ao Malezia amin'izao fotoana izao, izay efa nisy ary mbola ahiahian'ny Maleziana tsy manan-tsiny, salama saina ary tia-fandriampahalemana, ary hitohy tsy hisy fitsaharana izany. Indrisy fa tsy misy intsony ny fotoana tsara indrindra mety hanitsiana ny fahadisoana sy hanao zava-mahasoa ny Maleziana ankehitriny sy rahatrizay. Mihoatra ny 50000 ireo olona nanao fihetsiketsahana [teny malagasy] tao amin’ny araben’ny Kuala Lumpur tamin'ny taon-dasa, nandritra ny hetsika Bersih 2.0. Fihetsiketsehana nenti-nanery ny governemanta hanaiky ny fitakiana [mg] hisian'ny fanitsiana ny fomba fifidianana. Nivadika ho herisetra [mg] ny fihetsiketsehana milamina tamin’ny taon-dasa raha naparitaky ny polisy ny mpanao fihetsiketsehana milamina. Hitantsika eto ambany amin’ity ny lahatsary fanomanana ny Bersih 3.0 izay mampiseho hetsika sasantsasany nandritra ny hetsika Bersih 2.0 tamin’ny herintaona. Mamintina ny fahasorenan'ny Bersih ihany koa i Dahlia Martin mikasika ny torolalana momba ny fanitsiana ny lalam-pifidianana nalefan'ny parlementa. …many of the recommendations in the report did not carry timelines – meaning it was possible that a proposed reform might not be implemented in time for the next general election. Bersih has responded quickly to the prospect of what they call the “dirtiest” ever elections Malaysia faces in its call for an April 28 global protest. Maro amin’ireo torolalana notaterina no tsy nahitana tondrozotra- Midika fa mety tsy ho tanteraka ara-potoana ny fanitsiana natolotra, amin’ny fifidianana ankapobeny manaraka. Namaly avy hatrany amin'ireo antsoin'ny mpanao Bersih ho fizorana mankany amin'ny fifidianana “maloto indrindra” atrehin'i Malezia ny fiantsoana hetsika faobe amin'ny 28 Aprily. Nanao fandinihana i Dr. Ong Kian Ming izay nanontany ny amin’ny fahatomombanan'ny lisi-pifidianana. Finally, through a detailed analysis of the Q4 2010, Q1 to Q3 quarterly updates and the Q3 2011 electoral roll, it was found that there were over 106 thousand voters who were removed without public display and almost 7 thousand who were added without public display. Farany, manoloana ny famoaboasana antsipiriany ny lisi-pifidianana telovolana fahaefatra 2010, Ny fanitsiana nandritra ny telovolana telo voalohany ary ny lisi-pifidianana telovolana fahatelo 2011; hita fa mpifidy miisa 106 arivo no nesorina tsy nampahafantarina ny vahoaka, ary fito arivo koa no nampiana tsy nisy filazana hatrany tamin'ny vahoaka. Nanome hevitra ny Vaomiera misahana ny fifidianana i Khoo Kay Peng mba hijery akaiky ny fitarainana nataon’ny Bersih. If the EC does not address the discrepancy in the electoral roll immediately and swiftly before the general election, the commission cannot avoid mounting pressure for the chairman and his committee to step down. Its negative reaction so far gives credibility and relevance to Bersih 3.0. The authorities, especially the DBKL, should not try to frame the peaceful protest as a political campaign. It is a demonstration of people's frustration with the pace of reforms and a lack of sincerity from the ruling regime and its appointees. EC has less than 48 hours to announce its plans to clean up the electoral roll or face a major protest against its impotency and irrelevance. Raha tsy mijery akaiky avy hatrany sy haingana ny elanelana misy amin'ny lisi-pifidianana ny vaomieram-pifidianana), dia tsy ho afa-bela amin’ny fanerena ny filoha sy ny komitiny hametra-piàlana ny vaomiera. Manome fitokisana sy mampisongadina ny Bersih 3.0 ihany any aoriandriana any ny fihetsika fandavana ataon'ny Vaomiera. tsy tokony hanafangaro ny hetsika milamina ho toy fampielezan-kevitra politika Ireo manam-pahefana ary indrindra ny DBKL . Fomba hanehoan’ny vahoaka ny fahatezerany manoloana ny fandehan’ny fanovàna sy tsy fahampian’ny mangarahara eo amin’ny fitondrana sy ireo kandidà voatendriny izany. Manana 48 ora latsaka ny vaomieran'ny fifidianana hilazany ny tetikasany entina hanadiovana ny lisi-pifidianana na hiatrika hetsika lehibe indrindra miady amin’ny tsy fananany hery sy ny tsy fananany sori-dalana. Jacqueline Ann Surin namaly ny fanakianana sasany entina hanoherana ny mpikarakara ny Bersih. 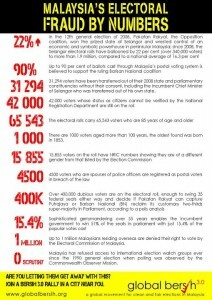 No matter who supports Bersih 2.0 and now Bersih 3.0, the proof that there is a need for citizens to express their dissatisfaction with the current electoral system is in the numbers. Tsy misy ny olana na iza na iza manohana ny Bersih 2.0 sy ny Bersih 3.0 amin’izao fotoana izao, porofo fa ilain’ny olom-pirenena ny maneho ny tsy fankasitrahany manoloana ny rafi-pifidianana misy ankehitriny. Araka ny hevitro, andraikitra nosafidiana ny fitadiavana hanampy ireo antoko politika, indrindra taloha, raha nandrahondrahona, ankahalalahana sy tsy voantohintohina hosamborina, amin'ny hanaovana herisetra ny olo-tsotra milamina, ireo mpiasa ho an'ny fanjakana na tsy miankina. Even tho, my wife is no longer a Msian, and we are too far away from the’ nearest’ location for Bersih. But in our hearts, we stil Willl be rooting for all of Us, who stand for the right 2B treated with respect. We stand for Justice. So so sad to see awful and heartless acts of police brutality on Innocent citizens who Want What is right. Stay Safe. Saingy ato am-ponay, miori-paka hatrany amintsika rehetra izahay, izay mijoro hanan-jò hohajaina. Mijoro ho amin'ny fahamarinana izahay. Tena malahelo tokoa mahita ny fihetsik’ireo polisy mahatsiravina sy tsy misy fo amin’ireo olom-pirenena tsy manan-tsiny mitady ny Zo. Matokia. Mbola miara-mandrindra amin'ny polisy amin'ny toerana ivoriana ny Bersih 3.0. Lasa hetsika manerantany ihany koa ny Bersih fa misy hetsika fanohanana ihany koa any amin'ny tanàna 41 any amin'ny firenena 14.